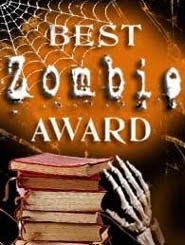 Bookbinding Etsy Street Team: BlueRoofDesigns wins the BEST Zombie Award! Congratulations to Elissa, of BlueRoofDesigns! Her accordion book, "Show me the Mummy" received the most votes in our team challenge. Elissa is hereby awarded the BEST Zombie Award for 2010, which includes unlimited bragging rights and the right to use the associated graphics on her own website and there will be a special feature here on our blog in the very near future. Way to go, Elissa! View the final poll results below. Weehoo! Thanks so much to everyone who voted for Odji. I'm really quite touched.